Big and small, urban, rural, or coastal, French cities have a patina of thousands of years of history and that indescribable French charm that makes them such a delight to visit. Greeks and Romans established many of the cities, and their location in the center of Europe made them a valuable target many armies fought over, and all left their marks. They are full of ancient castles, spectacular cathedrals, and magnificent palaces and surrounded by breathtaking natural beauty. 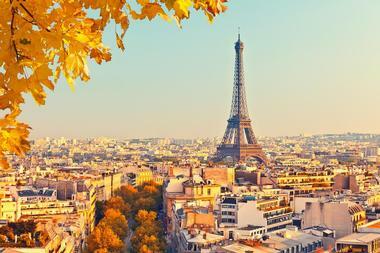 Everyone knows Paris, even if they have never been in it. Everyone knows the tall spire of the Eiffel Tower, the broad avenue of the Champs-Élysées with majestic Arc de Triomphe at its end, the enchanting Notre Dame cathedral, elegant bridges across the Seine, lovely sidewalk cafes, and priceless art treasures of the Louvre. Once a peaceful fishing village on the Mediterranean, St. Tropez needed Brigitte Bardot to transform it into a hot jet setters’ playground when she came in 1956 to film And God Created Woman. Celebrities come to be seen, tourists come to see the celebrities, the million-dollar yachts show off in the marina, and the village is bustling with crowds and buzzing with excitement. Located only about 22km from Paris in the quiet Parisian suburbs of Versailles, Versailles is the most glorious of all the French palaces and chateaus. The Baroque château was built in the mid-17th century by King Louis XIV and was the home of French kings until the French revolution. With time, various kings added to the splendor of Versailles, with additions such as the pink marble beauty of Trianon, Marie-Antoinette's estate, spectacular fountains, miles of formal gardens, and much more. 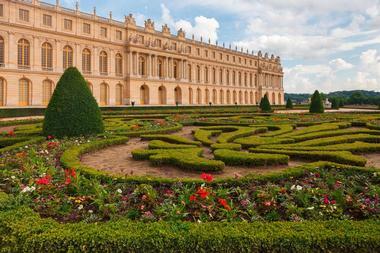 A visit to Versailles is as delightful as it is overwhelming. Versailles acquired a new role in the 19th century as the Museum of the History of France, and many royal apartments and lavishly decorated rooms were converted to house collections of artifacts that cover the country’s history until the early 20th century. 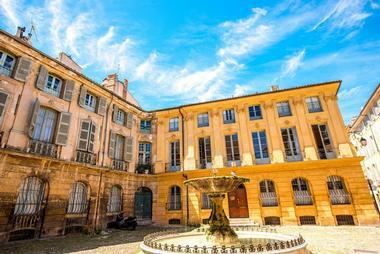 Founded by the Romans in 123 BC, attacked by the Cimbri and Teutones, occupied by the Visigoths, plundered by the Franks and Lombards, and occupied again by the Saracens, Aix started thriving only after the 12th century, when it became a seat of learning and an artistic center. 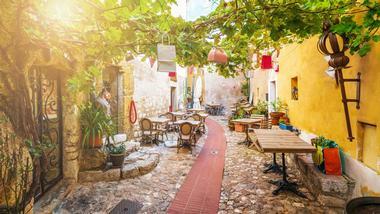 A home and inspiration of Paul Cézanne and a home of many art schools and several universities, Aix is breathtakingly beautiful, charming, and lively. It is full of magnificent architecture that reflects its turbulent and rich history, and the timeless beauty of Provence surrounds it. Shadowed by the imposing white limestone mountain, Aix is a city for walking – it is the only way to experience the cheerful chatter of students having coffee in one of many outdoor cafes on the main drag of Cours Mirabeau, admire elegant homes and many museums in the Quartier Mazarin, enjoy smells and colors of the flower market in the old town, and sit by one of many magnificent fountains. 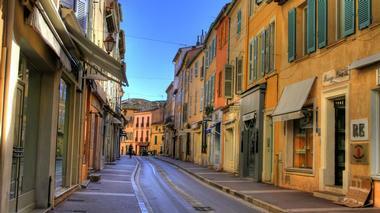 A jewel of the French Riviera, Antibes is a lovely resort town between Nice and Cannes on the Mediterranean coast. 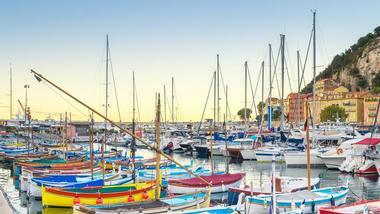 The old town is surrounded by the remnants of 16th-century ramparts with the Fort Carré, and it overlooks many ports, from fishing and cargo to luxury yachts’ marina Port Vauban. On one side of the town is the woody peninsula of Cap d’Antibes where the old trees hide many luxury villas of rich and famous Europeans who started coming to the lovely Antibes since the 18th century. With forty-eight beaches and sixteen miles of scenic Mediterranean coastline, Antibes is packed with tourists in the summer who are attracted not only by the wide, sandy beaches but also by thriving nightlife, great restaurants, and endless festivals. Beaujolais is a French province with its capital in historic Villefranche-sur-Saône, world-known for its light, fruity wine, and beautiful scenic landscapes dotted with picture-perfect vineyards. Located north of Lyon, Beaujolais is ancient and breathtakingly beautiful with charming stone villages, imposing Romanesque churches, and elegant17th and 18th-century Renaissance châteaux such as de la Chaize, de la Salle, and du Basty. You can visit the vineyards that surround many of the castles, stay overnight, and taste their wines. Some of the most beautiful castles like Bagnols are actually luxury hotels. In the 19th century, many vineyard owners built beautiful large manors you will notice standing proudly on top of the hill surrounded by orderly lines of vines. If you drive through Beaujolais in November when they open barrels of new Beaujolais wine, you will find roads dotted by farmhouses offering their own wine with some local cheese and sausages. World-famous for its film festival, Cannes is a luxury resort town on the French Riviera overlooking the blue Mediterranean and lined by sandy beaches. The town is known as the playground for the rich and famous, and there is usually a parade of expensive cars cruising along the Boulevard de la Croisette, which curves along the coast. It is lined on one side with beaches covered body to body with lounge chairs and umbrellas and on another with expensive boutiques and chic, palatial hotels. 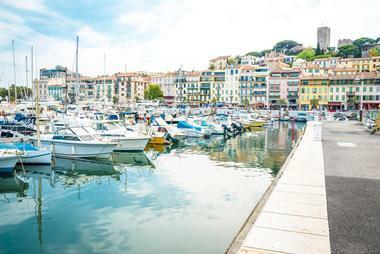 It is glitzy, expensive, showy, and very beautiful with a colorful lively harbor full of luxury yachts, while the charming old quarter of Le Suquet is perfect for strolling around and soaking up the city’s history. Located in the village of Chambord in the Loire Valley, the royal Château de Chambord is a stunning and massive châteaux, and is one of the most easily recognizable of the French castles for its distinctive French Renaissance style of architecture – a fine mix of traditional medieval French style with classical structures of the Renaissance. 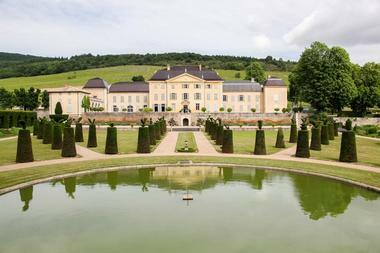 The chateau was built by King Francois I and completed in 1547 under Henry II. The chateau has eleven kinds of towers and three kinds of chimneys. It also has no symmetry and is framed at the corners by the enormous towers. Its silhouette resembles that of a city more than of a building. The towers and moat are decorative since the chateau was never meant to provide protection. 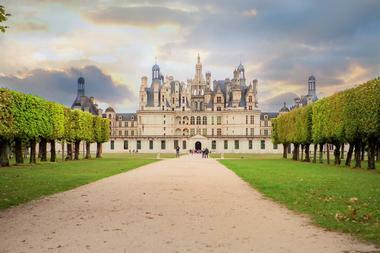 The château has 440 rooms, 282 ornate fireplaces, and 84 staircases including a unique double spiral staircase. It is surrounded by a 13,000 acre park and hunting reserve and a 20 mile long wall. Èze is a gorgeous town in southeastern France, renowned internationally for its stunning hilltop views of the Mediterranean Sea. 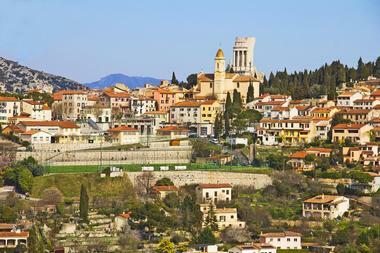 The French Riviera city, which is located approximately eight miles from Nice, was a favorite European destination for famed animator and entrepreneur Walt Disney and retains much of its medieval character, with buildings such as the Chapelle de la Sainte Croix dating back to the 14th century. World-class attractions within the city include the Jardin Exotique d'Èze, which has received a TripAdvisor Certificate of Excellence for its beautiful collection of cacti, succulents, and other exotic plants. A large number of art galleries, boutiques, and restaurants line its beautiful historic downtown area. Located about 23 km from Nice on the border with the Principality of Monaco high up in the Alps at 1,150m and hanging over the Mediterranean, La Turbie looks like it is floating in the sky with the gigantic 35 meter high Trophee d’Auguste dominating the landscape. Built 2000 years ago by the Romans, the magnificent monument is the town’s pride, so start your exploring there before strolling through charming cobblestoned streets with ancient stone houses with flowers dripping from every window. You will pass under vaulted passageways, sit at cool little stone fountains, admire old gemelled windows, and take a photo of the enormous ornate fountain and beautiful baroque church with an interesting square bell tower and varnished tiles on the roof. Take one of many narrow paths up the hill through beautiful local parks and enjoy the magnificent views that stretch for miles – on a clear day, you can see all the way to Corsica. 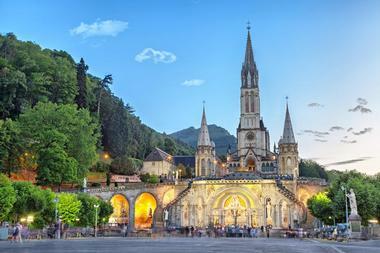 Lourdes is a small town in the foothills of the Pyrene in south-western France. For centuries, the town was known for the beautiful fortified castle Château fort de Lourdes perched on an escarpment in the town’s center until 1858 when young peasant girl Bernadette Soubirous reported sightings of the Virgin Mary at the Grotto of Massabielle. The city became one of the world's biggest pilgrimage sites and religious tourism destinations with six million visitors that descend on Lourdes every year. The city has a constant flow of religious activities – you can attend mass, take part in the daily Candlelight Procession, or visit the Basilica of the Immaculate Conception. Surrounding magnificent mountains offer an opportunity to enjoy breathtaking natural beauty such as the Gavarnie Falls. 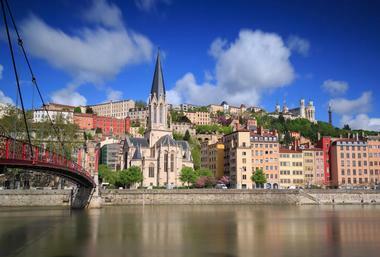 Lyon is a 2,000-year-old city in France at the confluence of the Rhône and Saône rivers. The whole city is one large museum, from the Roman Amphithéâtre des Trois Gaules, austere medieval, and ornate Renaissance architecture in Old Lyon to the covered dark passageways between towering buildings that connect Vieux Lyon and La Croix-Rousse hill. Lyon is also a modern, sophisticated city, and it is the third largest in France with excellent museums, vibrant nightlife, great shopping, and lively atmosphere added by the students from the local university. Lyon is famous for its unique gastronomy and excellent restaurants. Some of the must-see sites are the Basilica of Notre-Dame de Fourvière and the beautiful square Place des Terreaux with Fontaine Bartholdi. 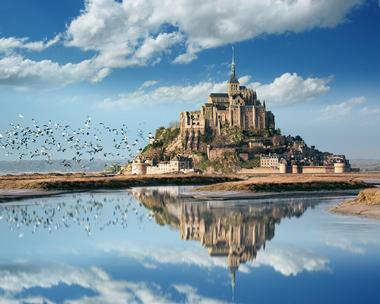 One of the most magnificent sights in Europe, Mont Saint-Michel is located in the bay where Brittany and Normandy meet. The small but incredibly beautiful island looks like it is floating in the air with the medieval monastery perched high up on the cliff and ancient ramparts surrounding its banks. The monastery was built in the 8th century by Aubert, bishop of the nearby Avranches. The construction of the magnificent Benedictine abbey was supported by the dukes of Normandy and later by French kings. 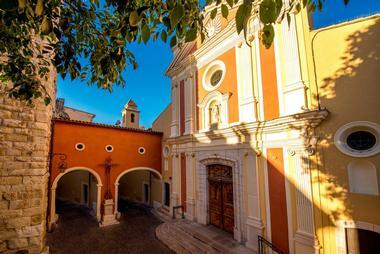 The abbey became a famous center of learning, with some of the greatest European minds spending time between its walls. Many other buildings were added to the steep village street, most now converted into hotels, restaurants, museums, and boutiques. The island and the bay are declared a UNESCO World Heritage Site. 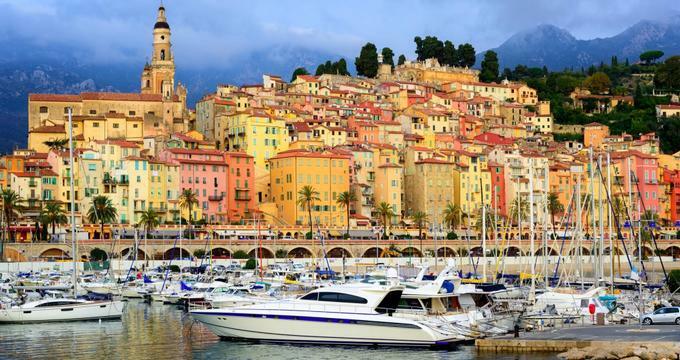 Established by the Greeks in 350 BC and made fashionable by rich and famous Europeans in the 19th century, Nice is a lovely coastal city on the French Riviera between the Mediterranean and the Alps. It has a huge pebbly beach that hugs the bay, shops, restaurants, and all kinds of hotels that greet millions of tourists every year. Once the playground of the elite, Nice is now flooded by tourists from all over the world who cannot resist the unique combination of a perfect sunny climate, warm Mediterranean waters, spectacular architecture, ancient ruins, superb French cuisine, and all the tourist trappings of the 21st century. The mesmerizing beauty of the city and its lively spirit has attracted artists for a long time – Henri Matisse and Marc Chagall called it home at one point and created some of their best works in Nice. 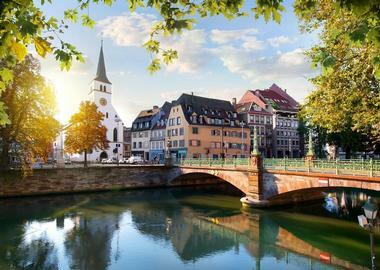 Strasbourg is an interesting old town that the Romans established 2000 years ago and many armies fiercely fought over. Located strategically at the border between France and Germany, it has a bit of everything with regards to culture, language, religion, and even food. It is perfectly unique and very much its own. You can feel the city’s history from Roman and medieval times – the Gothic cathedral in the old town will take your breath away – and you can feel the buzzing energy of a modern city with a large university and many European institutions established here, including EU Headquarters. Stroll by the scenic canal that reflects colorful townhouses in its murky waters and stop by one of winstubs (typical Alsace taverns) to try the local goodies. The small charming town of Fontainebleau just south of Paris is popular with both locals and tourists. While tourists flock to the magnificent Chateau de Fontainebleau, locals love to escape the bustle of the city to the shady, magnificent Forest of Fontainebleau that is spread around the castle. Both the forest and the castle are recognized as a world heritage site by UNESCO. The castle was built in the 12th century as a royal hunting lodge, but it was abandoned and neglected for centuries until the 16th century when King Francois I rebuilt it and incorporated then fashionable French renaissance style that makes the castle so beautiful today. The king also incorporated many elements from Italian renaissance, especially Rome. The most striking elements are the Trinity Chapel with painted walls and ceilings, magnificently decorated royal apartments, the Pope’s apartment, Napoleon’s apartment, and the Francois I Gallery, and it is decorated in the typical highly ornate renaissance style and so much more.